If your existing concrete pool deck is showing its age or you want a more decorative surface, pool deck resurfacing may be an option. Resurfacing is basically adding a new finish to your pool deck. After repairing any chips or cracks in your concrete, a new coating will be applied to the surface. Resurfacing products can be troweled or sprayed to most surfaces to add color and texture. Some resurfacing products also allow for stamping for the look of stone without replacing your concrete. We offer many ways to breathe fresh life into your pool deck. As a leading Las Vegas pool deck repair company, we offer many options to upgrade your worn-out pool. We help pool owners transform their outdoor spaces with versatile and budget-friendly solutions. You can count on our pool deck experts to recommend the right product to meet your needs. 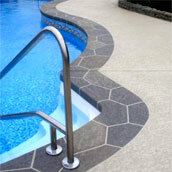 A concrete overlay is a cost-effective way to repair and resurface your existing concrete pool deck. An overlay does not require removing and replacing your old concrete. Instead, the overlay is applied on top of the existing slab for a brand-new surface. Concrete overlays are available with limitless finishes. Get a custom pool deck by choosing the texture, color, and pattern of the overlay. 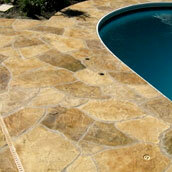 For pool decks, stained and stamped concrete pool decks are both popular. 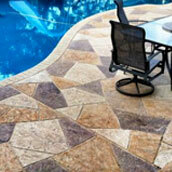 The look of beautiful stamped concrete can easily be achieved with an overlay. This involves applying the overlay at a 3/4″ thickness before using a stamping mat to create patterns and textures. Stamped concrete can mimic the look of brick, slate, and other stone. Color can be applied with the same techniques used for regular stamped concrete. 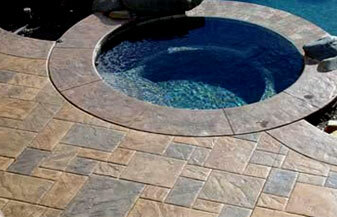 If you are interested in a decorative overlay, the condition of your pool deck is important. The concrete foundation for the overlay must be sound for the overlay to last. If your concrete has serious issues like large cracks or unstable soil, an overlay will not work. If you simply have discolored concrete or a slab with minor cracks and stains, an overlay is the ideal choice. Microtoppings allow you to choose the grade — ranging from fine to coarse — and the color. 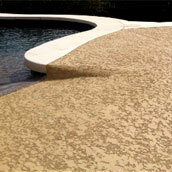 If your pool deck looks worn out, micro topping can give it a new surface. This type of system is good for giving existing concrete a makeover or adding slip resistance and texture. You can choose to have saw-cut designs added as well. Microtoppings have a thickness of up to 1/8″. A spray-down concrete system allows you to choose the finish and color of your pool deck. This type of system is sprayed onto the prepared concrete with a hopper gun to create a textured, slip-resistant surface. Spray-down toppings are similar to microtoppings because both are thin. Spray-down products usually have a rougher finish, though. 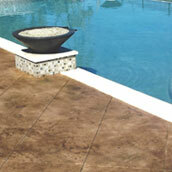 A stamped concrete pool deck is popular because it can mimic the appearance of materials like tile, stone, or brick. When it is applied and finished, no one will know the surface is actually concrete. A stampable overlay will be applied at a thickness of 1/4″ to 3/4″. We use only high-quality products for results that last. 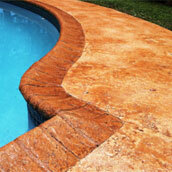 One of the most popular products for pool deck resurfacing is Sundek. 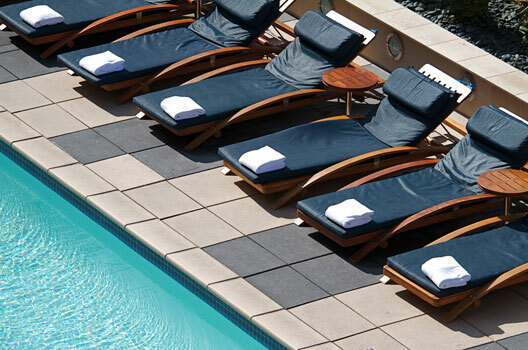 Sundek is a leading provider of pool deck finishes. Their line of products include stains, acrylics, and sealers that can change the texture, color, or surface of your concrete. We use many Sundek overlay products to give your pool deck a new surface. These products can be used together and with aggregates and stains to create a custom look. We also use Kool Deck concrete topping to restore and protect pool decks. Keystone Kool Deck has been used since the 1960s to create a colored and textured cement surface. Unlike some products, it is just as strong as the base concrete slab. Kool Deck is very effective at reducing heat on the surface of your pool deck for greater comfort on bare feet. When stamped, it can resemble travertine, granite, and other types of natural stone. Kool Deck has remained popular for so long because it’s versatile. It can reduce heat buildup on your pool deck by more than 30%. Unlike most coating products, it does not rely on creating valleys and crevices to keep the surface cool. This means a uniform surface that’s easier to keep clean without attracting dirt. It can also be mixed with exterior acrylic paint for unlimited color options. If you have an existing Kool Deck, we also offer Kool Deck repair and resurfacing. We use a unique product to repair an existing Kool Deck surface and create a new, cool, and slip resistant surface. This Kool Deck repair product can be tinted to any color and it can repair small hairline cracks. Have questions about having your pool deck resurfaced? Here are the most common questions our customers ask about Las Vegas pool deck overlays. How Long Does Resurfacing Take? 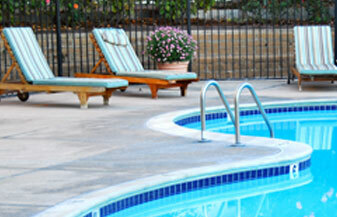 Resurfacing your pool deck does not take as long as you may think. Decorative overlays can be applied to concrete with little downtime. Some polymer overlays can even support foot traffic after a few hours. The time needed to resurface a concrete pool deck will depend on many factors. This includes whether concrete pool deck repair is necessary, the type of overlay you choose, and any decorative finishes you want. Our pool deck resurfacing experts will give you an idea of how long the process will take during a consultation. How Often Does a Pool Deck Need to Be Resurfaced? There is no specific time frame that a pool deck will last before it should be resurfaced. You should consider resurfacing your pool deck when it’s surface has become too smooth. When wet, a smooth pool deck can be a safety hazard. This can pose a safety hazard. Resurfacing can add a new non-slip texture. You may also want to resurface the pool deck if it has hairline cracks or other defects like staining. Because resurfacing can transform the surface, it can be used to completely refresh an old, worn pool deck. How Long Will the Resurfacing Last? When an overlay is applied correctly and protected with a coating or sealer, it will last for decades. Concrete overlays can even withstand heavy traffic. The important thing to remember is an overlay will only be as strong as the concrete base. If the concrete is cracked when the overlay is applied, it will crack as well. Surface preparation is the most important step to a successful concrete overlay. If the concrete is not prepared, the overlay will crack and fail. If your concrete has cracks, they will be treated with a two-part epoxy to rebond the crack. If necessary, the cracks will be backfilled with sand prior to the epoxy. Any non-structural crack that is larger than a hairline should be repaired. 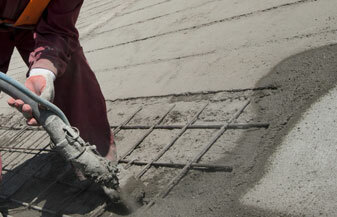 If your concrete has paint, it will need to be grinded down to the substrate. The goal of surface preparation is to restore the surface to plan concrete before the overlay is applied. Your pool does not need to be drained to resurface the pool deck. However, this will involve masking and covering the pool to protect it from the materials. If you do not drain the pool, it will affect the price of pool deck resurfacing. Ready to resurface your pool deck to say goodbye to cracks, stains, and a dangerously smooth surface? We serve the greater Las Vegas area with cost-effective pool deck resurfacing options. We offer everything from microtopping and coatings to concrete overlays to completely revamp your aging pool deck. Contact us today to learn more about your options and request a free estimate.